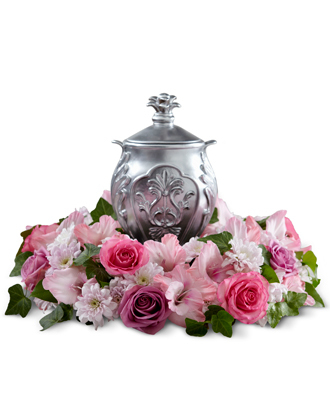 A wreath of lovely, fresh, pastel blossoms makes a bright and blushing setting for an urn containing the cremated remains of a loved-one for visitation, a funeral or memorial service. The wreath is hand-fashioned by a local artisan florist of lavender cushion pompons, pink gladiolus and pink and lavender roses atop a base of variegated greens with a flat bottom for stability on a tabletop or altar. It can also be used to enhance the display of religious statuary, a meaningful photograph or memento or a candleholder. Urn not included.